At the 2019 Gower Show, honey and related products will be on show once again in the honey tent. This is a “Blue Ribbon” honey show. The Blue Ribbon is designed as the premier award at honey shows round the country and can only be awarded by a qualified National Honey Show Judge. 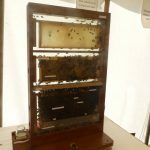 For many beekeepers the highpoint of the season is exhibiting at the various honey shows that take place around the UK and the Gower Show is no exception. Honey shows consists of a range of different categories, or classes, with something to challenge all levels of beekeeping skill. There are classes for beekeepers to show their skills at honey presentation in all its forms including wax presentation, honey in jars, crafts, mead and photography In fact there are classes for almost any activity related to bees and the hive products including novice classes. We encourage as many beekeepers as possible to enter the show. The discipline involved in preparing the exhibits great skills in the presentation of honey and other hive products. On our website timetable page, you will find full details of the competition with links to the list of classes and how to enter. Entries will be accepted up to 8pm Thursday 1st August 2019. No entries will be accepted after this date. We are also pleased to announce that The DOROTHEA DANIEL-JENKINS CHALLENGE CUP will be awarded to the exhibitor with the highest aggregate points in the show on Sunday 4th August 2019 at 5.30pm. © 2018. The Gower Agricultural Show is run by Gower Agricultural Society.